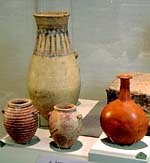 Stone and clay pots comprise one of the most important categories of Egyptian artifacts. They help us understand the evolution of the culture from the Predynastic Period to the end of the pharaonic era. The banks of the Nile provided the mud and clay used to make ceramic ware. Food was cooked in clay pots, which also served as containers for grains, water, wine, beer, flour and oils. Baskets were the other type of container found in the home. They were made from reeds and the leaves of date palms that grew along the Nile. Skilled artisans were considered socially superior to common labourers. They learned their art from a master who ensured stylistic continuity in the beautiful objects they created for the living and the dead. Women engaged in weaving, perfume making, baking and needlework. Very few artistic creations were signed, and exceptional ability was rewarded through increased social status. Skilled carpenters manufactured a wide range of products, from roofing beams to furniture and statues. Their tools included saws, axes, chisels, adzes, wooden mallets, stone polishers and bow drills. Since wood suitable for building was scarce in ancient Egypt, it was imported from countries such as Lebanon. His field is the timber, his hoe the adze. He does more than his arms can do (...)"
Sculptors had to adhere to very strict stylistic rules. The stone was first shaped and smoothed by masons using stone hammers. For bas-reliefs, draftsmen outlined images on the stone before a team of sculptors began carving them with copper chisels. A fine abrasive powder was used to polish the stone before the images were painted. In this illustration, craftsmen from the Temple of Karnak polish and paint a red-granite statue of Thutmosis III, on which they carve an inscription. And a string in the rear." The ancient Egyptians produced numerous monumental and life-size stone statues of pharaohs, nobles, gods and goddesses. They presented themselves as proud self-confident people capable of ruling their land and defying their enemies. Stone vessels were made by shaping the stone and smoothing its exterior with abrasives such as quartz sand. A crank-shaped drill was used to hollow out the interior. Various types of semi-precious stones were used in jewellery. To make beads, artisans broke stones and rolled them between other stones to shape them. 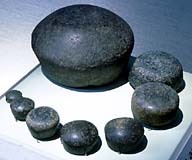 A bow drill was used to drill a hole through the beads, which were then rolled in a recessed receptacle containing an abrasive to refine their shape. The word iqdou (Nile mud) was used to designate the profession of the brickmaker and the potter, who used mud from the Nile to make their products. The brickmaker had one of the more menial occupations in ancient Egypt. To make bricks, Nile mud was mixed with sand, straw and water, slapped into wooden moulds and then slapped out onto the ground to dry in the sun. Bricks were used extensively in ancient Egypt for building everything from peasants' homes to the pharaoh's palaces. Potters produced vast quantities of utilitarian vessels. Cow dung, water and straw were mixed with mud to produce clay ready for the potter's wheel. The exterior surface of pots was often covered with a reddish slip and/or decorated using a stylus or comb before the pots were fired in kilns. It comes straight from the fire. In a good year, the quantity of grain harvested in Egypt far exceeded the needs of the country. The grain exported to neighbouring countries provided a rich source of revenue for the Egyptian Treasury. Egypt's economy functioned on a barter system. In the marketplace, stone weights were used to determine the value of grain and other rations. Egyptian merchants developed an extensive trade network for procuring goods from other countries. Gold from the mines of eastern Nubia, for example, was traded for raw materials or manufactured goods. Women of all classes could earn wages, own property and employ workers, but their main role was within the family. The title most women had was "mistress of the house". They were considered equal with men before the law, and could sue for damages and divorce. Musical scenes on murals seem to indicate a predominance of female musicians during the New Kingdom. Music served both secular and religious purposes, with many high-status New Kingdom women holding the position of "chantress" to a local god. Harps, lutes, flutes, oboes, tambourines and sistra (rattles) were the main instruments used.